The following services are available to licensed annuity agents – fill out our information request form to find out more. 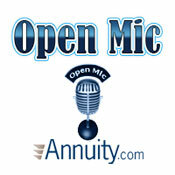 Hosted by Bill Broich, a 100 Plus Million Dollar Annuity Producer and Co-Founder of Annuity.com, Open Mic is held on Thursday mornings at 9 a.m. PST. Each week Bill brings other multi-million dollar producers together in this 30 minute call to discuss industry trends and give their seasoned and expert advice. Started in 2008, this forum has always been open to any licensed agent in the industry, and questions are welcome. Through the collaborative efforts with their annuity partners, Tony and Chad Owen have created a field marketing organization that shares the tools and annuity marketing lead systems used in their own personal production. If you partner with Annuity Agents Alliance, you will get direct training from multi-million dollar producers and access to all of our annuity marketing and sales tools. This incredible subscription tool provides an innovative annuity illustration and income calculator that allows for side-by-side comparisons from multiple insurance carriers. Accessible online for licensed Annuity Agents 24/7. * Free to Annuity Agents Alliance Contracted Agents. We’ve got the inside scoop on the best leads in the business! Our experienced agents are constantly reviewing lead sources and recommending only the best performers. * Some of our recommended providers have negotiated Discounted Rates For Annuity Agents Alliance Contracted Agents. Retire Village is our comprehensive marketing & database system designed to help you build your pipeline, nurture your prospects, generate new leads and close business. * Discounted Rates For Annuity Agents Alliance Contracted Agents.